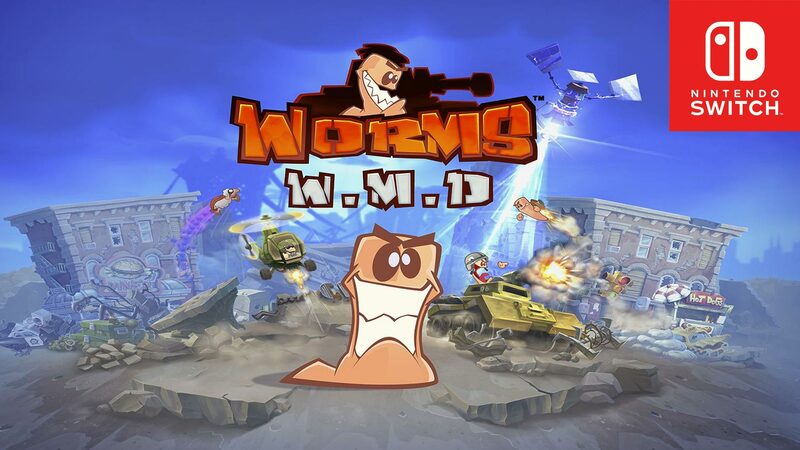 We’re giving you the opportunity to show off your Worms W.M.D gameplay on Nintendo Switch for a chance to a Team17 Switch title of your choice! To enter, you’ll just need to capture and upload a funny play, incredible move or an epic fail clip showcasing the mayhem that occurs in Worms W.M.D. Your clip can come from any game mode, with any amount of worms, the choice is yours! Then all you have to do is share your clip on Twitter with the hashtags #WormsSwitch and #WormsWMD between Friday 9th February and Friday 16th February and we’ll pick our two favourites. We’ll be judging submitted clips based on originality, creativity and hilarity. Remember to include both hashtags in your post too so we can find it! If you’re unsure how to use the new video capture ability, just press and hold the Capture Button until you hear a ‘beep’ to save the previous 30 seconds of play. We’ll be retweeting our favourites and announcing winners on Twitter once the contest is closed. May your bazooka fly true! The title of the competition is Worms W.M.D Video Capture Contest. Entry is free to all eligible users of the game who satisfy the requirements detailed below. The competition will run from 18:00 GMT on 9thFebruary 2018 until 11:59 GMT on 16th February 2018. Any entries received by the Promoter after this point will not be considered. Multiple entries are permitted. The Promoter accepts no responsibility for any entries fnot received for any reason. All entries will be reviewed by the “Panel of Judgment”, composed from members of the Promoter. The Panel of Judgment shall select the top entry which best satisfies the judging criteria. The decisions of the Panel of Judgment shall be final and no correspondence or discussion will be entered into. Odds of winning a prize depend on the number of eligible entries received and each entrant’s ability to provide the winning criteria. Winner(s) will be notified by private message through their means of entry and announced on to general public on social media and websites belonging to the Promoter. Winner(s) will receive a Switch download code for a Team17 game of their choice – subject to availability. By claiming a prize, winners agree that the Promoter can use their name, likeness and place of residence (in the format of ‘Rob W of Nottingham, UK’) for advertising and promotional purposes and for the purposes of fulfilling legal obligations. Details of the winner(s) may be published on social media belonging to the Promoter, as well as the website testsite.t17service.com and Promoter’s newsletter. By entering the competition, you are confirming that the submission is your own work and does not infringe the rights (including the intellectual property) of any third party. You hereby waive all moral rights in respect of any copyright in the name or copyright material submitted by You. In consideration of You entering into this competition you hereby assign all copyright and other intellectual property rights in the name and content submitted by You and accept that Promoter may use such name and content for any purposes whatsoever, including marketing and promotional purposes, in whatever media and format. You agree to allow the Promoter to display any name or image you submit. You accept that the Promoter may alter the visual appearance of the name and images before they are displayed.